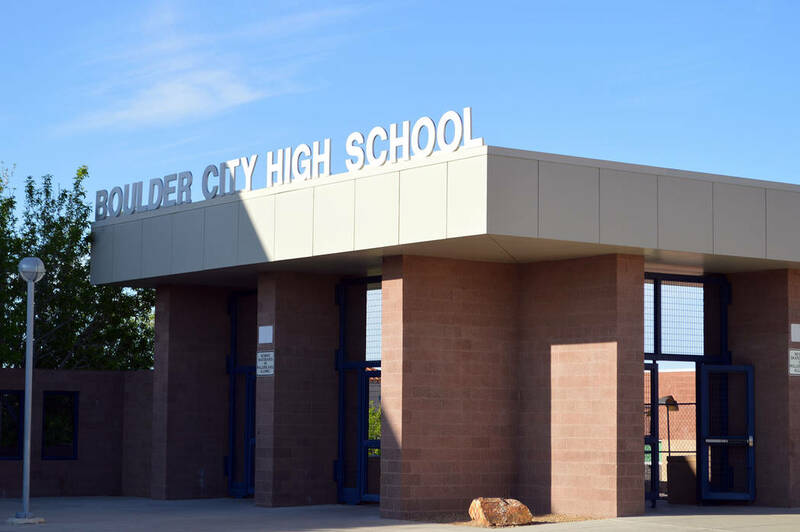 Hosting a weekly event against Pahrump Valley and Virgin Valley on April 27, both Boulder City High School track programs head their own against their rivals. Outscoring Virgin Valley (68) and Pahrump Valley (26) with an overall score of 88 points, the Lady Eagles rolled to a team victory behind a strong performance from their senior laden core. Senior Kenadee Bailey was at her usual best placing first in triple jump, long jump, 100-meter hurdles and 300-meter hurdles, while senior Sara Stepherson placed first in the pole vault with a leap of 9 feet. Senior Jordyn Trobiani placed first in the 400-meter dash with a season-best time of 1:01.4, while finishing second in the high jump with a leap of 4-10. Junior Sierra Selinger swept the distance events, placing first in the 800-, 1600- and 3200-meter runs. Hitting a pair of personal bests, junior Taylor Tenney finished second in the 200-meter dash with a time of 28.6 seconds and second in the triple jump with a personal best leap of 31-3.5. Sophomore Geri Watchel (second place in 300-meter hurdles with time of 55.7 seconds), junior Lani Potter (third place in 200-meter dash with time of 30.5 seconds) and Stepherson (third place in the long jump with a leap of 15 feet) all hit personal bests as well. Despite falling behind Pahrump Valley, which ousted the Eagles 81-74, the boys still had a solid event at home behind all-around junior star Zach Trone. Placing first in the 100-meter dash, 400-meter dash, long jump and triple jump, Trone was the only top athlete only for the Eagles. Trone hit personal bests in the 100-meter and 400-meter dashes with times of 10.7 seconds and 53.9 seconds, respectively. Also setting a personal best, juniors Buddy Boggs and Briggs Huxford tied for first in the pole vaulting competition, reaching 12 feet. Huxford also set a personal best in the long jump with a second-place finish of 19 feet and in the 200-meter dash with a third-place time of 24.5 seconds. Boggs hit a personal best in a second-place 300-meters hurdle finish with a time of 43.6 seconds. Senior Tyler Campbell had a pair of second-place finishes in the 800- and 1600-meter runs with times of 2:11.6 and 4:42.6, respectively. With the season winding down, the Eagles will prepare for their last regular season race Friday at Moapa Valley for the Grant Bushman Invitational. Friday, Grant Bushman Invitational at Moapa Valley, 2:30 p.m.